Free Shipping Included! Karman 19.8 lbs Ergonomic Ultra Lightweight Wheelchair by Karman Healthcare at In The National Interest. MPN: S-2512F18SS. Hurry! Limited time offer. Offer valid only while supplies last. Karman Healthcare introduces the latest advancement in Aluminum bending by offering the lightest weight non custom aluminum wheelchair in the market. Karman Healthcare introduces the latest advancement in Aluminum bending by offering the lightest weight non custom aluminum wheelchair in the market. Weighing only 19.8 lbs, the Ergo Flight is made of Aircraft Grade T6 Aluminum with a globally patented s-shape seating frame, and a technically advanced design geometry. 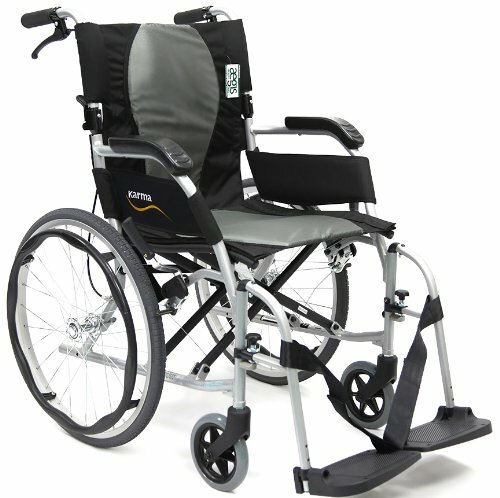 Featuring companion brakes, folding backrest, padded seat and back anti bacterial upholstery, removable footrest with heel loops and 20"x 1 3/8" solid rear wheels with 6"x1" front casters, and a weight capacity of 220 lbs. If you have any questions about this product by Karman Healthcare, contact us by completing and submitting the form below. If you are looking for a specif part number, please include it with your message.